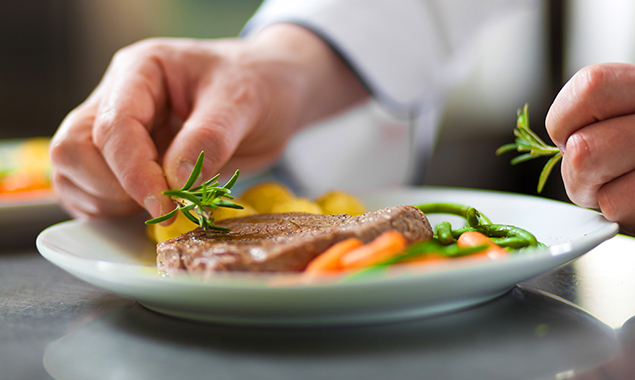 We believe that meal times are a fundamental aspect of relaxation. Therefore, our in-room dining menu provides an abundance of choices so that our guests can enjoy their meals peacefully in their own rooms. The menu of vegetables is produced in Shonan and Kamakura area and other dishes are available 24 hours a day, so that guests can eat whenever they want to. 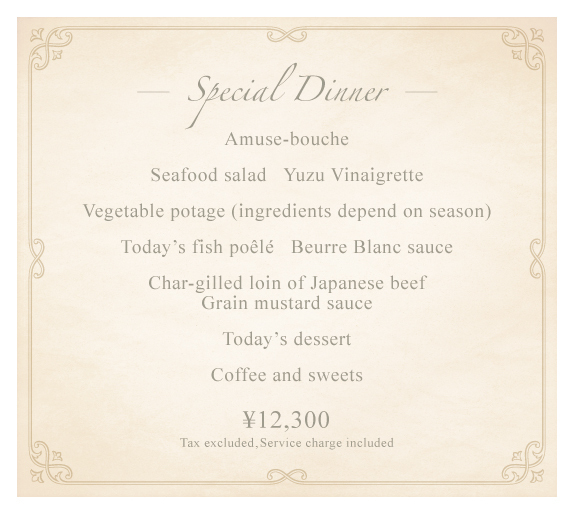 For those who wish to dine outside of the hotel, we've prepared a “Breath Hotel Special Menu”, a luxury French cuisine course at the Mikasa Kaikan a five-minute walk away from the hotel. Also, for those who would like to indulge a little, please do visit the Organic Grill Kugenuma Kaigan, a three-minute walk away from the hotel, and enjoy Breath Hotel’s original lunch and dinner courses. Coupons for local restaurants (popular ones not listed in travel guides) are also available. 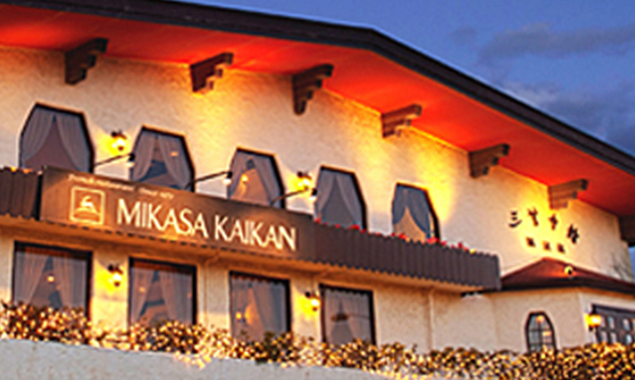 Visit the Mikasa Kaikan, just a stone’s throw away, and ask for the “Breath Hotel Special Menu”. Look no further for indulgent French cuisine made with seasonal ingredients and fresh seafood. *Menu may vary depending on available stock. Surrounded by greenery, this organic restaurant serves dishes with only specially chosen ingredients. Enjoy original French cooking in a chilled, retro-modern atmosphere, featuring quality organic ingredients sourced locally, including seasonal produce from no further than Fujisawa. Recommended for guests looking to add a spot of luxury to their weekend out. We serve a special dinner course for guests staying at Breath Hotel. For those looking for a casual lunch, please do check out our lunch menu. *For those on a stay plan with a meal coupon included, feel free to change dinner to lunch at the Organic Grill Kugenuma Kaigan. To give the local food a try, we've prepared a￥2,000 meal coupon for stay plans which include dinner. Present this coupon to our member stores for a cash discount. We can recommend popular local joints that you won't find in your travel guide. Some of the restaurants have Breath Hotel exclusive menus. Don’t miss out! "What do you feel like?" Exclusive Dinner Meal Coupon. Choose from five places to enjoy the best gastronomy that Shonan has to offer! 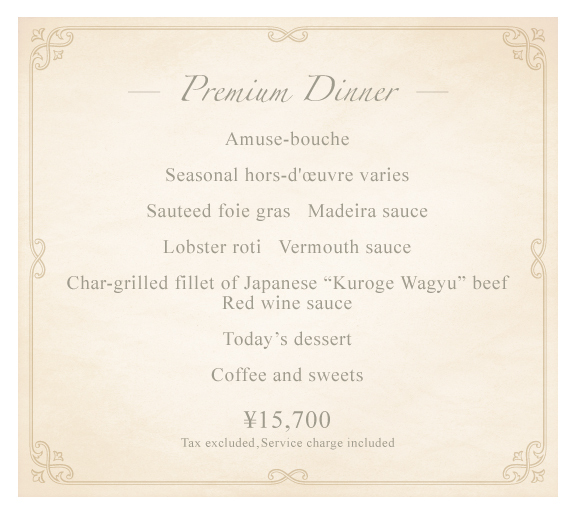 Get great value for money and enjoy A4-grade Japanese "Kuroge Wagyu" beef. Come here for authentic, specially select Italian dishes. Give their original pancake a try – you won’t regret it! The finest local ingredients featured in exquisite, lovingly created dishes! Meet new foods, drinks, and people. One step inside, and it's always summer! Yakitori, deep-fried skewers, appetizers, drinks … whatever you'll take, it'll blow your mind! Waranka takes you down memory lane, while you enjoy the drinks and food that you won’t find anywhere else. * Can only be used for lunch at Organic Grill Kugenuma Kaigan. * We provide a shuttle service to these restaurants. We will ask you whether you will require this service when you check-in. * Establishments may be closed outside regular closures for specially designated periods / whole venue bookings etc. Please inquire for availability. * For those who make reservations on the day, please be advised that bookings may be difficult due to popularity and limited availability. Breath Hotel's in-room dining service offers a wide selection of dishes. Have the meal delivered at your preferred time and enjoy it in the comfort of your room. Indulge in dishes made with vegetables and other natural ingredients harvested from the Shonan and Kamakura area. Our check out time is at 12:00 noon so you can spend a relaxing morning in your room.